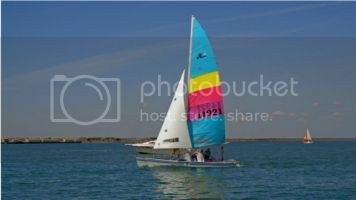 Hobie Forums • View topic - is this an EPO rudder? is this an EPO rudder? Post subject: is this an EPO rudder? ran across this online, its hard to tell in the photo. looks like its been painted to me, can't see the original sticker at all nor any glass strings. can you tell if its epo rudders and not the SX PCG rudders? Post subject: Re: is this an EPO rudder? Hard to say for sure from the picture. The weight would be a dead giveaway. I agree, it looks like these rudders have been painted and there are some yellowish marks on the bottom one which suggest that it may be a lexan rudder, so my guess would be that they are not EPOs, but again, it's very hard to tell with certainty from the picture. Looks like our Race Rudder. At a time when EPO was not available we did "Race Rudders" Very similar to EPO. Thanks! Any benefit to one over the other? These are 250 for the pair. Pretty positive they are the newer style casting holes. My local hobie shop has a set of epo blades with nice edges and just barely showing glass string on sides a little. Can get them for 175. They where mounted on a 16. The EPO has a digitized foil shape and is the best we have ever made. The older race rudders are excellent, but not as perfect. You had plastic before? You would love either one. Awesome! This is good to hear. I replaced the bolts and bushings in the tiller/rudder system and have been really happy with how it handles. I'm embarrassed to admit, I thought I had epo rudders, nope. Boat sails amazingly although everything is new except hulls and crossbars. I have no idea what epo rudders will do. I asked our lord cal shop owner about the difference, he didn't say a word just smiled huge. I have a pair of original EPO's, and they look the same to me. The only reason I know mine are original EPOs is that when I was reconditioning them, I found the imprint of the original sticker on the rudder where it had been previously painted over. Even though the sticker was gone, the detail of the sticker was visible, which really surprised me. But without a sticker, I really don't know how you'd be able to tell the difference. I'm not questioning matt, as he really knows his products, I'm just curious why he thinks its one and not the other. A word of caution about fitting rudders... if you have an H18 with the older style rudder castings, DON'T try to force a thicker rudder into the casting. If it doesn't fit, file down the casting and/or sand down the rudder head. The casting will break if you force it, and cast material does not weld back together. I'm just curious why he thinks its one and not the other. Interesting, I didn't realize the "race rudders" had a high gloss finish. I assumed the same as black4est, that these rudders were painted and that the paint had been worn off in areas, but now that I look again, I see that they do have a very reflective finish, and the picture was taken seemingly in the shadow of a tree. What I thought were areas of wear seem to be a reflection of the sky. While I'm sure EPO's could be polished up or painted, you probably wouldn't get that level of gloss in the finish. I'm not so sure about Matt's diagnosis. The rudders have been refinished. The race rudders came out of a mold (they were fiberglass - the finish was gel coat sprayed into the mold). The surface finish of these looks like brushed on, tinted polyester resin, not the super smooth finish of the mold. If you look where the finish has flaked off from casting wear, you can see the charcoal gray underneath - the color of a 1st generation EPO. But the only true way to tell is to weigh them. EPOs are very light - about half the weight of Lexan or race rudders. the only true way to tell is to weigh them. EPOs are very light - about half the weight of Lexan or race rudders. What would you say the weight of a typical EPO blade is, vs a race rudder? My EPO's are definitely a lot lighter (and stiffer) than the lexan rudders that came on the boat, but I wonder how much weight I added when I resurfaced them. 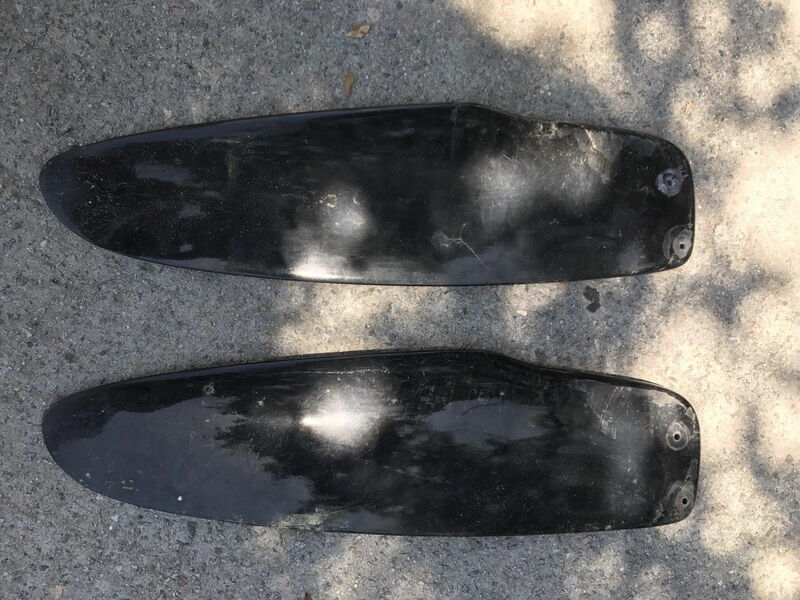 I had to coat them and sand them down about 4 times after I bought them (per Surf City's video https://www.youtube.com/watch?v=jNwMgX48uwQ), the glass was all exposed on one side of each blade (they had clearly been left in the sun at some point, then spray painted over to look like new... but in reality it was a very poor prep job and the paint peeled almost immediately after use). If I had to guess off of the top of my head based on memory, I'd say that my lexan rudders are 8-10 lbs each, whereas the EPO's are probably in the 4-6 lbs range. Of course, that doesn't help someone buying based on pictures online. But any fiberglass rudder is going to be better than the old style plastic. I imagine that the current fiberglass rudders and old race rudders had a similar foil shape to the EPO's, but just weigh a bit more. With the most important characteristics of the rudders being #1 shape and #2 stiffness, it's nice to have lightweight rudders, but like Matt Miller said, any glass rudder is a big improvement.